Go back to the roots in nature with this package for eco-village of yurts, the natural rhythm of life and nomadic lifestyle which is almost impossible today! The Yurt is made from fully sustainable materials (pine, leather, pure cotton, wool, linen ). It is built of wooden poles which are bound in leather. No nails, no screws, no wires. No corners and obstacles. The wall behind the wooden frame is made of cotton, linen and blankets. Thus the temperature in the yurt, regardless of the season, is always between 15 and 25 degrees. You can expect harmony and tranquility in combination with organic food prepared from organic products grown in the village. The package is for 2 people and includes accommodation, bio breakfast, archery or rifle lessons and buggy riding. 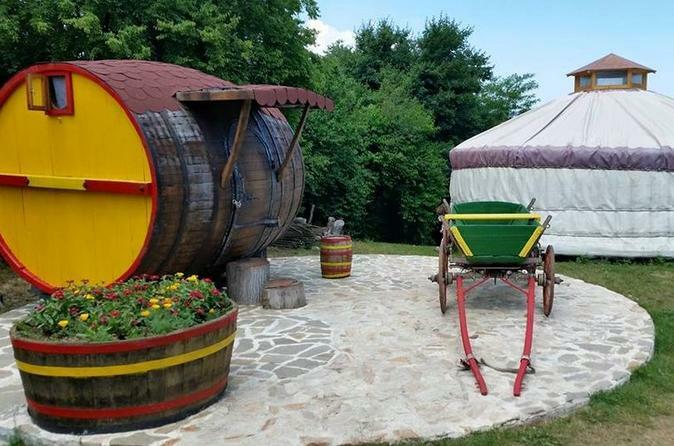 Accommodation can be in a yurt or "barrel" specially built for this purpose. A sleeping bag is provided on request. You can add horseback riding instructor - suitable for complete beginners and inexperienced. It has a positive energy space allowing you to experience something amazing in a completely different world. In the eco-village of yurts, recreation will be complete. Health, harmony, and tranquility in combination with organic food prepared from organic products grown in the village. Give yourself a return to nature and the natural rhythm of life! Give yourself the freedom characteristic of elementary nomadic lifestyle, which today is almost impossible! It's an adventure of a lifetime to remember!